This is an interesting technical problem, especially when one learns that the grasses being used in Singapore’s tropical climate are “rye and blue grass.” I presume that these are perennial ryegrass (Lolium perenne) and kentucky bluegrass (Poa pratensis). These species are used in locations where the average annual temperature is less than 16°C. In the two coolest months of the year in tropical Singapore – December and January – the average temperature is 26°C. Where in Asia does one find these cool-season grasses? In Beijing, Seoul, or Sapporo – in places where it is cooler than Shanghai. Where it is warmer than Shanghai, warm-season grasses are used, and especially when the average annual temperature is more than 20°C, there is almost exclusive use of warm-season grasses. This chart plots a number of world cities by average annual temperature. A check of the turf species forming the base surface on sports fields in those locations will confirm that temperature cutoff point. The reason cool-season grasses don’t persist in temperatures above those optimal for growth (15 to 24°C for leaves, 10 to 18°C for roots) is because of higher respiration and less net photosynthesis. Grasses make carbohydrates through photosynthesis, and they use carbohydrates through respiration. If more carbohydrates are used than are made, the plant is said to have a negative carbon balance. Under prolonged heat stress the imbalance between carbon consumption and carbon production results in the depletion of carbohydrate reserves, which in turn limits the survival of turfgrass. Rather than construction delays, it would seem that this negative carbon balance, an inevitable result when growing cool-season grasses in a tropical climate, would be an issue with grass performance on the pitch. I’m not sure if the soil is cooled. I've not read about that in the Straits Times. Based on research with other cool-season grass species, and observations of kentucky bluegrass and ryegrass performance across a range of temperatures, those species would probably provide an acceptable turf in Singapore if the rootzone temperature could be maintained below 22°C. The kentucky bluegrass turf at Kashima Stadium in Ibaraki, Japan, grows well during months when the temperatures are cooler than at Singapore; during the 2 hottest summer months at Kashima, when temperatures are similar to Singapore, the grass is weak and uses its carbohydrate reserves accumulated during the 10 other months with suitable temperatures, to survive. But the average annual temperature in Singapore is more than 26°C, and the rootzone temperature, if a refrigeration system is not being used, would be very similar to the air temperature. So why would rye and blue grass be used? I can guess that it has to do with the amount of light that reaches the pitch. There is an extensive roof on the National Stadium. This will restrict the amount of photosynthetic light that reaches the grass. And cool-season grasses generally have a lower light requirement than do warm-season grasses. If the rootzone at the stadium were maintained at less than 22°C, the cool-season grasses may have a chance to survive and to perform better than warm-season grasses. That's only because of light requirements for the different types of grass. Cool-season grasses may outperform warm-season grasses with light restriction in tropical temperatures, but only if the rootzone is refrigerated. Based on the performance of the grass so far, it does not appear that the rootzone is cool enough. Warm-season grasses thrive in hot weather because their photosynthetic pathway is adapted to efficient carbohydrate production at high temperatures. But warm-season grasses have a higher light requirement, in general, than do cool-season grasses. The light available for photosynthesis is expressed as a daily light integral (DLI). It is the photons of photosynthetically active radiation striking a surface in one day, expressed in units of moles of photons per square meter per day. I’ve estimated that the average DLI in Singapore, accounting for cloud cover, but assuming there is no shade from trees or buildings or roofs, will be about 35 mol m-2 d-1. I guess perennial ryegrass and kentucky bluegrass may receive enough light to perform well, assuming the rootzone is cool enough, at a minimum DLI of 20. If the roof at the National Stadium restricts 80% of the natural light from reaching the pitch, then the DLI on the pitch would be about 7. Supplemental lighting could be used to increase the amount of photosynthetically active radiation. But if the natural light is restricted too much, supplemental lights won’t be able to add enough to the DLI. Supplemental lights, run for 24 consecutive hours, may increase the DLI by about 15 mol m-2 d-1. A quantum meter at Kashima Stadium measures the instantaneous photosynthetic photon flux density; adding together each instantaneous measurement for the course of a day gives the daily light integral (DLI). With those assumptions – that a DLI of 20 is required, that the roof blocks 80% of the light leaving a DLI without supplemental lighting of 7, and that with supplemental lights on for 24 hours a day, one could get a DLI of 22 – it would seem that it just might be possible to have grass on the pitch. But I don’t know the actual light restriction caused by the roof, or the exact specifications of the supplemental lighting system. One can see that the success of the grass on the pitch comes down to a math problem. First, is the temperature of the rootzone cool enough for the species being grown? Second, is the DLI high enough to support the necessary growth and recovery of the grass? The nual noi variety of manilagrass (Zoysia matrella) is a warm-season grass that may also require a minimum DLI of 20 to produce an acceptable turf. That is, for a warm-season grass, nual noi is relatively tolerant of shade, and in fact has a similar DLI requirement to cool-season grasses. And perhaps most importantly, for the situation of a venue with an intensive events calendar, it grows rapidly compared to other warm-season grasses. In experiments at Thailand, with grasses given the same fertilizers and grown at a DLI of about 30, nual noi had 52% and 25% greater clipping yield than bermdugrass and seashore paspalum, respectively. Whether any grass can work in the environment of the National Stadium, and which species it should be, will come down to what temperature the rootzone can be maintained at, and how much light is provided to the pitch. Turfgrass Mystery: can you identify the grass on this putting green? 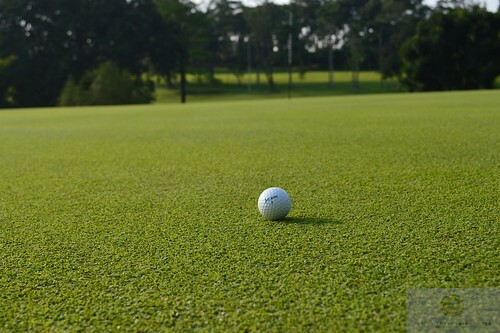 This is a warm-season (C4) grass that performs well on putting greens in the tropics. Click the image above to see a larger view. The photo was taken on a putting green in Asia just 1° north of the equator. I've seen it as a fairway or lawn grass, but as a putting green turf, I've only seen this use in Asia. It seems to perform best with relatively minimal maintenance and does well in areas with relatively high cloud cover and rainfall (it is not a Cynodon species) where bermudagrass struggles. It also grows well in some relatively cool, because of high altitude, areas near the equator. It should probably be used on more golf courses. Can you identify this grass? Here's another photo. It looks almost like creeping bentgrass, doesn't it? The answer is serangoon grass (Digitaria didactyla), also known as blue couch. and then by Albert Bancroft. 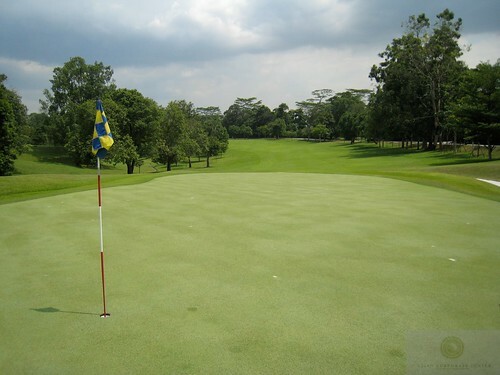 We find serangoon grass greens in Singapore, and in Malaysia, and they generally perform very well. I've also seen this grass thriving on the greens of the famous Nuwara Eliya Golf Club (below) high in the mountains of Sri Lanka, at Bangalore, and at the organically-managed Kodaikanal Golf Club in Tamil Nadu. It is great to see information sharing about turfgrass management, and I'm pleased to see that the Agronomy Team at Singapore's Sentosa Golf Club are expanding on their tournament volunteer and seminar program this year by also adding a blog and a twitter account to provide updates about the preparations for the Barclays Singapore Open. 82 Days until the Barclays Singapore Open. Lowered mowing height this morning 0.03mm on the greens. Mowing height is now 3.11mm. And check out the blog for information about volunteering at the Barclays Singapore Open and additional information and videos about course maintenance activities.